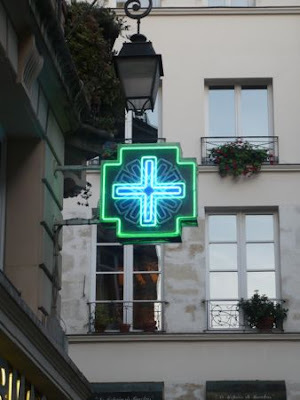 I’ve always been equal parts intrigued and intimidated by the pharmacies here in Paris. Unlike the sprawling Duane Reades in New York, or even a modest Connecticut CVS, they tend to be relatively small, so it’s not about the size. 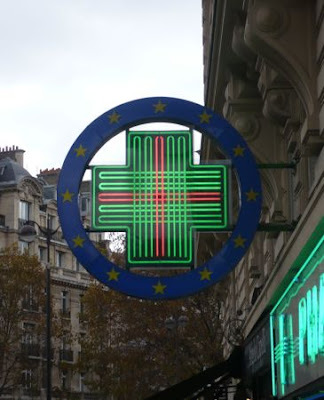 But maybe that’s just it: there’s not enough space and privacy to try to decode the promises and ingredients of all those special French salves, potions, pills, lotions and magic solutions. Plus, if I can drop fifty bucks without a blink of an eye at Duane Reade, just imagine how much damage I could do picking up an assortment of pretty jars of body lotion and special regime tablets. Still, I love the variations of the green cross that evoke all these images. It's funny, the Paris pharmacy used to intimidate me as well. Do I go in for expensive clinical body creams? Or just for some advil? Both? It was an interesting experience, especially since I always feel like an interloper when I go in just to look at lotions or lip balms. I see the pharmacists eying me like, "does she need to be in here for something?". I used to have such good shopping sprees in Paris, at the pharmacies. The bath products I brought home ! the lotions and potions .. the best of lip balms and bath fizzies came from a pharmacy. They are similar here, not as "exotic" but similar .. 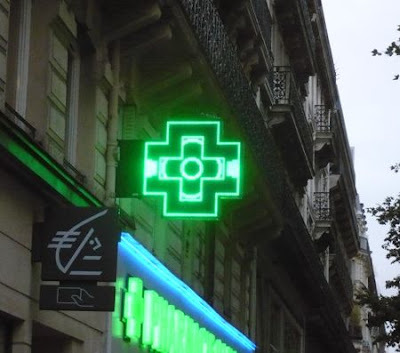 I remember seeing those little green crosses the first time we visited Paris. I kind of like how there's a universal symbol. 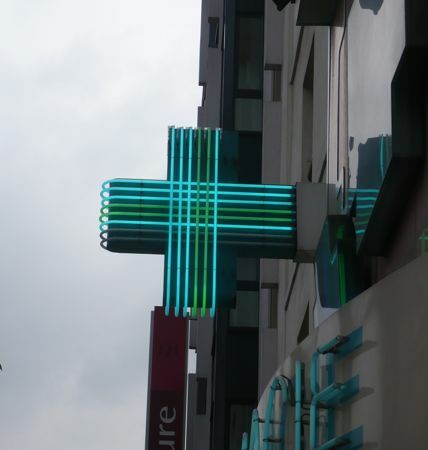 If you are ever in need, you can just scan the streets for a glowing green cross. I love your collection of photos, so neat to see the different interpretations. 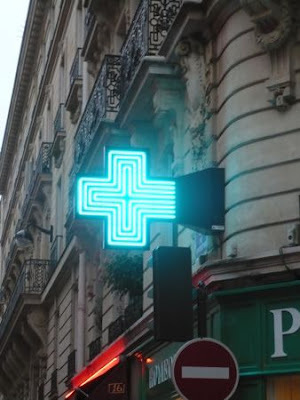 I bought the most foot-saving shoe inserts at a pharmacie last time I was in Paris. They were 15 Euros, but worth every centim! 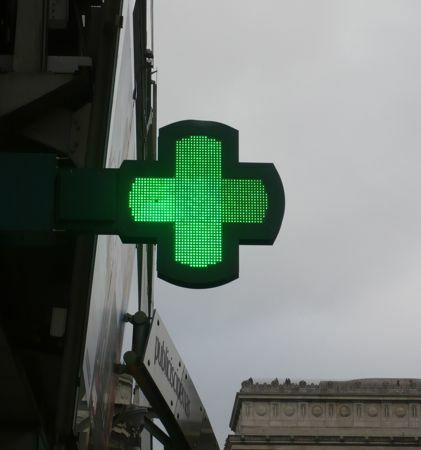 I love that each one is just a bit different but still the universal sign...they use it in Rome, too. 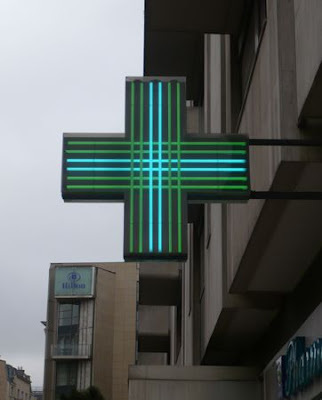 I was so intimidated I never actually went into one...I hear they can actually give prescriptions without a doctor (have no idea if that's true...) The signs are beautiful, a study in subtlties. 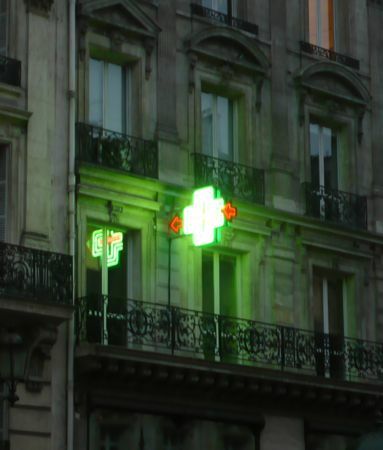 I took a gazillion pictures of those GREEN pharmacies last trip.. I'm terrified of them too. It's like a visit to the doctor or the dentist- they are sooo attentive. And everyone seems to be buying TONS of medications!! 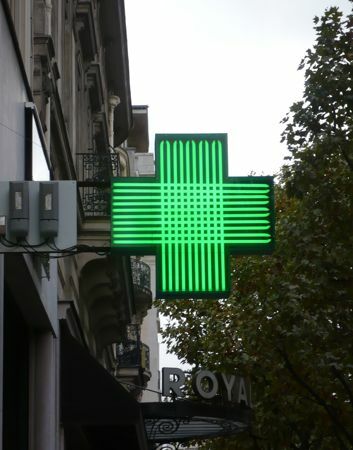 I love the green pharmacy signs of Paris too. It's an awesome paragraph in favor of all the internet people; they will get advantage from it I am sure.